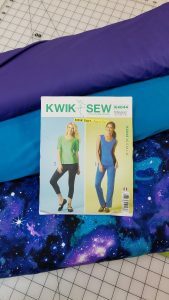 We will be using the Kwik Sew Pattern K4044 and will be make view C, the leggings. The pattern is available in the store. BEFORE class! Please be sure that you have your leggings pre-cut so that we can sew in class. The class fee includes the price of the class and the pattern.